The new ARPES-Lab provides a total solution for ARPES. 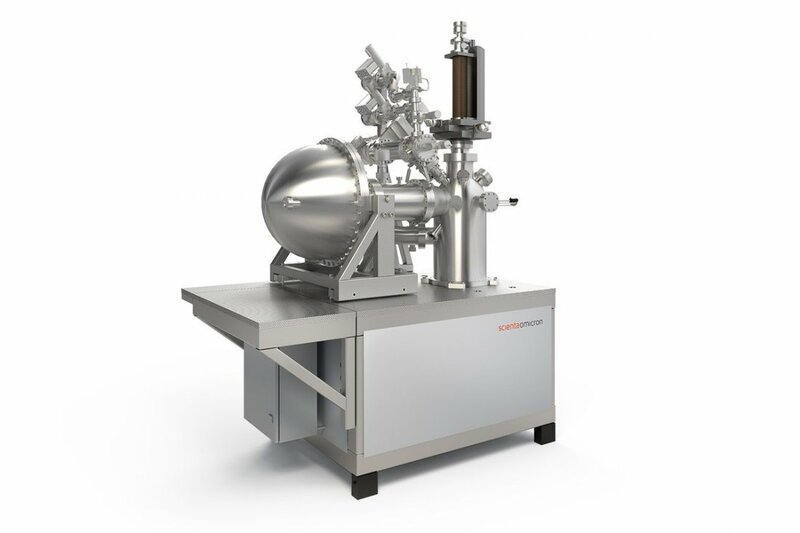 The design takes advantage of Scienta Omicron's vast experience in the field of electron spectroscopy. Since a turnkey solution with single vendor performance responsibility is being offered, critical issues such as magnetic shielding and system grounding (examples of requirements for high resolution experiments) are addressed throughout design and manufacturing. All Scienta Omicron systems are upgradeable and extendable to multi-technique systems. Paths for adding for example SPM and MBE capability are available to make the ARPES system even more competitive as a scientific tool. With the introduction of the DA30 analyser family, the development of the hemispherical analyser takes a quantum leap. Using a new deflector concept (patent pending) these novel analysers can sequentially measure electrons in a full cone of 30 degrees opening angle. This development opens up for band mapping of the full surface Brillouin zone without the need to rotate the sample. In combination with the available spin detection systems the DA30-L also allows for spin-resolved measurements of the full cone acceptance without sample rotation. This represents a major breakthrough in spin-resolved measurements, since spin-resolved measurements could previously only be recorded for electron emitted parallel to the lens axis, and contributes to a substantial reduction in acquisition times. The high voltage electronics provides ultra stable conditions for reliable accurate measurements. Electron detection is realised by a modern 2-D low noise digital CCD-MCP detector system with a noise level of < 0.01 cps/channel. Furthermore the analyser is equipped with real time read-out and electronic analyser lens X/Y deflectors for diagnostics and experimental optimisation purposes. A stainless steel chamber with single mu-metal liner is the standard choice for state-of-the-art high resolution measurements of kinetic energies typically generated by UV excitation. The chamber will be made of stainless steel grade AISI 316 L (Flanges: AISI 304) and provided with a single mu-metal liner. The guaranteed residual magnetic field in the critical volume around the analysis spot is specified < 0.5 μT. This will be measured and verified before delivery. For ultra-high resolution at the lowest energies, typical for laser excitation, a stainless steel chamber with double mu-metal liner giving a guaranteed residual magnetic field < 0.1 μT is recommended. This is the preferred choice for high resolution studies of electrons below 10eV kinetic energy and is available as an option. The chamber offers ports for the DA30-L analyser, excitation sources, e.g. VUV and X-ray sources, charge neutralization, sputter gun, pumps, pressure measurement, viewports, manipulator, and sample transfer. The configuration discussion will be initiated from a Scienta Omicron well accepted standard design. The vacuum system is mounted on a rigid steel frame with ±5mm height-adjustable mounting feet, so that attachment to an adjacent vacuum system is easily possible. The DA30-L analyser can in the design phase be orientated with the energy dispersive plane horizontal or vertical. The bench is optimized for small footprint and prepared for future system upgrades and extensions. The Scienta Omicron ARPES analyzers are delivered with SES, a measurement and optimization software which runs on Windows 7. A modern, well-performing computer which meets the requirements of SES is delivered with the spectrometer. The computer also comes with Igor Pro installed for spectrum analysis. SES supports measurement of several common and rare methods such as EDC, XPS, UPS and ARPES, CIS, CFS and NEXAFS (the latter three requiring monochromator control which is possible to integrate into SES). It can measure these either at a fixed energy or by sweeping the energy, and it displays acquired data continuously during acquisition. The many energy and angular channels provided by the Scienta 2D MCP/CCD detector system are exploited to the fullest in the acquisition software ensuring fast and effective measurements. SES contains functionality to perform automated series of measurements with individual parameters. The SES sequence manager allows the user to set up for example a multi-point/angle analysis series controlling both spectrometer and manipulator, if motorization option for the manipulator is chosen. The SES software is built on a modular concept to encourage development of custom add-ons. The Application Programming Interfaces (APIs) for the SES add-ons, such as synchrotron monochromator, are fully documented. Furthermore, Scienta Omicron will give support to development using these APIs. Developing e.g. an add-on to SES which performs pulsed heating of a sample, in combination with data acquisition is an example of possible customization. SES saves measurement data in three formats: Igor Binary Wave (.ibw), Igor Packed Experiment Template (.pxt) and a well defined proprietary text format (.txt). The Igor file formats are native to WaveMetrics Igor Pro. These formats are also accepted by analysis packages such as CasaXPS. Scienta Omicron systems are delivered with the Mistral system controller, a programmable logic controller (PLC) with intuitive, user-friendly touch screen control for vacuum system control. This allows complete and fast status overview of valves, pumps, pressures and bake out. The PLC offers several interlocks to maintain a safe operation of the system at all times. The bake-out procedure is easily programmed and pre-configured in the PLC. 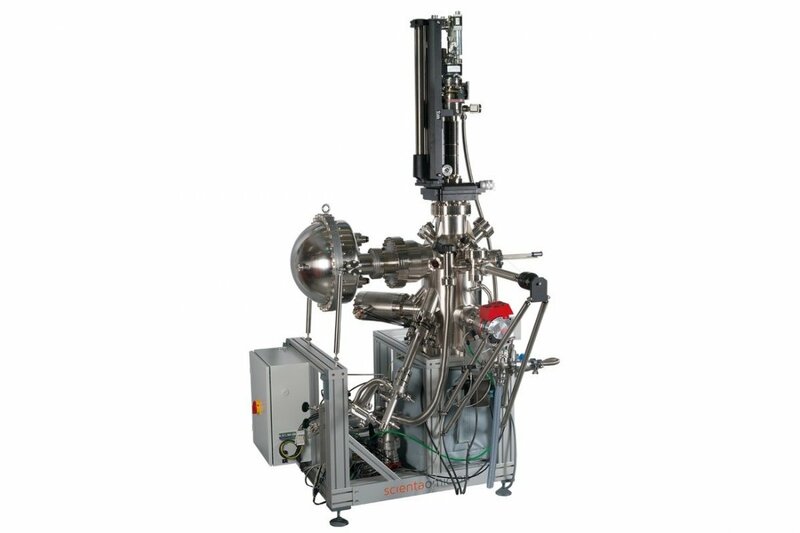 The UHV system includes a 19" instrumentation rack housing all control electronics. Mistral also ensures upgrade paths to include additional components, everything from simple sources to advanced SPM modules, in the system and interlock chain.